Nurse in the womb, who gives breath to enliven all he makes ..."
The themes of universalism, divine oneness, the exclusivity of Aten and his tender care for all creation drive home the point that ‘there is none’ beside Aten. This is a monotheistic statement, not unlike the Islamic confession ‘there is no god but God’. And on the theme of divine oneness, the Jewish Shema comes to mind: ‘Hear O Israel, the LORD our God, the LORD is one.’ The sun-god was a universal deity: wherever one went in the world, the Sun appears. Atenism was a monotheistic experiment in ancient Egypt of the 14th century BC. Historians of religion over the past 150 years believe such a shift to monotheism must have been a gradual development taking place over millennia. Just like every field of learning in the 19th and early 20th centuries, the academic study of religion was shaped by evolutionary philosophy, an extension of Darwinian thought. From this perspective, religion began in the distant past from animism, where everything – trees, rivers, rocks, etc – was possessed by spirits; followed by totemism; then polytheism; henotheism; culminating finally in monotheism. This linear development took thousands of years, it is claimed, moving from simple to complex forms. Some thinkers maintain that monotheism was achieved in the 6th and 5th centuries BC for the ancient Jews, a development mirrored among Greek philosophers, in Zoroastrianism and some other Asian religions during the same general period. But with Atenism, as the evidence suggests, the evolution from polytheism to monotheism occurred rapidly, in just a few years, contrary to the traditional understanding that monotheism appeared eight centuries later. This was probably the result of a theophany experienced by Akhenaten himself; i.e. Akhenaten had his own divine encounter that gave rise to Atenism. Typically, what is needed for a religion to endure is that a leader or prophet who believes he or she received a divine message has a band of faithful followers to disseminate the tradition, and a set of authoritative writings is preserved for future generations. This is the case of Moses and the Torah (the Law). Similar is the case for Christianity with Jesus, his apostles and the New Testament Scriptures, and likewise Muhammad and the origins of Islam and the Qur'an, as well as Joseph Smith, the Latter-Day Saints and the Book of Mormon. 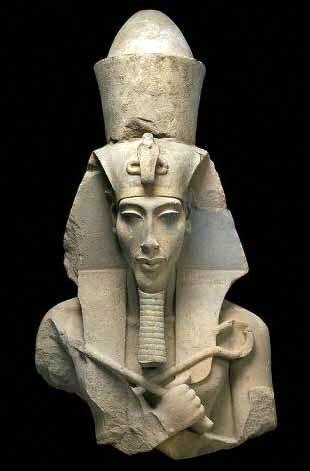 Akhenaten’s movement lacked followers who shared his convictions so that, when he died, his family and the priests and officials who had served him jettisoned Atenism and restored Amen-Re atop the pantheon of other Egyptian deities. Aten’s temples were demolished, the great city Akhetaten was deserted, and the various hymns to Aten that expressed the theology of his religion remained memories on the walls of tombs. Not one of these has been found in later writing to indicate that a scriptural tradition resulted. If indeed Moses lived in the 13th century BC as many scholars today believe, then it seems likely that Akhenaten was the first man in recorded history to embrace the exclusive worship of one god. But it is the teaching of one God expressed in the Hebrew Bible that has endured the test of time, and remains the longest lasting monotheistic religion. Atenism was an idea whose time hadn’t yet come: a shade of the great monotheisms to be. Last edited by masklofumanto; 02-16-2019 at 10:28 AM. 27 “But I say to you that hear, Love your enemies, do good to those who hate you, 28 bless those who curse you, pray for those who abuse you. 29 To him who strikes you on the cheek, offer the other also; and from him who takes away your cloak do not withhold your coat as well. 30 Give to every one who begs from you; and of him who takes away your goods do not ask them again. 31 And as you wish that men would do to you, do so to them. 32 “If you love those who love you, what credit is that to you? For even sinners love those who love them. 33 And if you do good to those who do good to you, what credit is that to you? For even sinners do the same. 34 And if you lend to those from whom you hope to receive, what credit is that to you? Even sinners lend to sinners, to receive as much again. 35 But love your enemies, and do good, and lend, expecting nothing in return; and your reward will be great, and you will be sons of the Most High; for he is kind to the ungrateful and the selfish. 36 Be merciful, even as your Father is merciful. Jesus offers a very challenging, seemingly impossible approach to daily life. It makes one want to say, “Seriously, Lord?” Unless we look at this way of life from a stewardship point of view. A steward understands clearly that all he has and all that he is — his very life — is a gift from God given to him from an unfathomable abundance of love. This changes everything! This means “my” cloak, “my” tunic, “my” money and time — all of it ultimately belongs to God. He has entrusted these things to each of us in love to use for His purposes and His glory. Does this mean we are to be passive “doormats” to anyone who wants to take advantage of us? Certainly not. Jesus explains this when He says, “Do to others as you would have them do to you.” He knows that we naturally desire only good and nothing bad for ourselves. And there is nothing wrong with loving oneself since God loves us and has made us in His own image and likeness. Jesus is simply asking that we also approach others, and the sharing of our gifts, with this same attitude. He is giving us a definition here of real love, a steward’s love! In fact, Jesus tells us that anything short of this is not love at all. “For if you love those who love you, what credit is that to you? Even sinners do the same.” We are made for much higher than that. 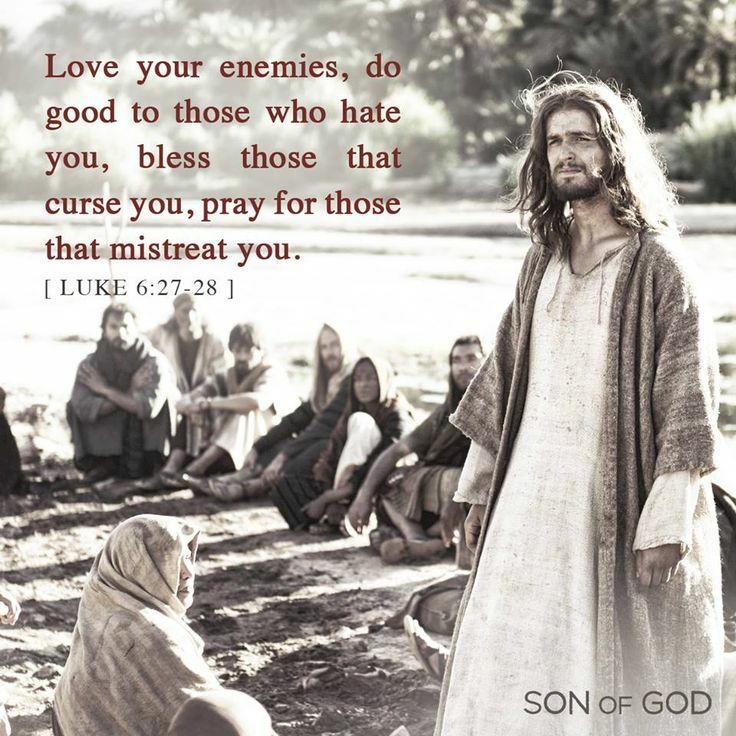 Jesus says instead, “Love your enemies and do good to them and lend expecting nothing back.” That is true greatness in God’s view. When we love like that, He promises our “reward in heaven will be great.” A stewardship way of life is a life worth living because it is modeled after nothing less than our Most High God. Jesus gives us one more bit of loving motivation. “Give and gifts will be given to you: a good measure, packed together, shaken down and overflowing will be poured into your lap. For the measure with which you measure will in return be measured out to you" (Luke 6:38). Be generous with your gifts — with your life — and Our God and Father will be superabundant in His love and blessings. Last edited by masklofumanto; 02-23-2019 at 03:04 PM. "The Scriptures present to us two kinds of true fasting: one, by which we try to bring the flesh into subjection to the spirit, of which St. Paul speaks in 2 Corinthians 6:5: “ In labors, in watchings, in fastings.” The other is that which we must bear patiently, and yet receive willingly because of our need and poverty, of which St. Paul speaks in 1 Corinthians 4:11: “Even unto this present hour we both hunger, and thirst,” and Christ in Matthew 9:15: “When the bridegroom shall be taken away from them, then will they fast.” This kind of fasting Christ teaches us here while in the wilderness alone without anything to eat, and while he suffers his penury without murmuring. The first kind of fasting, one can end whenever he wills, and can satisfy it by food; but the other kind we must observe and bear until God himself changes it and satisfies us. Hence it is much more precious than the first, because it moves in greater faith." Martin Luther, Luther’s Works, St. Louis Edition, 11, 534. Last edited by masklofumanto; 03-01-2019 at 10:32 PM. 4 1 And Jesus, full of the Holy Spirit, returned from the Jordan, and was led by the Spirit 2 for forty days in the wilderness, tempted by the devil. And he ate nothing in those days; and when they were ended, he was hungry. 3 The devil said to him, “If you are the Son of God, command this stone to become bread.” 4 And Jesus answered him, “It is written, ‘Man shall not live by bread alone.’” 5 And the devil took him up, and showed him all the kingdoms of the world in a moment of time, 6 and said to him, “To you I will give all this authority and their glory; for it has been delivered to me, and I give it to whom I will. 7 If you, then, will worship me, it shall all be yours.” 8 And Jesus answered him, “It is written, ‘You shall worship the Lord your God, and him only shall you serve.’” 9 And he took him to Jerusalem, and set him on the pinnacle of the temple, and said to him, “If you are the Son of God, throw yourself down from here; 10 for it is written, ‘He will give his angels charge of you, to guard you,’ 11 and ‘On their hands they will bear you up, lest you strike your foot against a stone.’” 12 And Jesus answered him, “It is said, ‘You shall not tempt the Lord your God.’” 13 And when the devil had ended every temptation, he departed from him until an opportune time. "Lead us not into temptation, but deliver us from evil." This part of the Lord’s Prayer is perhaps the most difficult to comprehend. After all, why would God subject His own people to temptation? Why is it necessary to petition God not to lead us into temptation? Before the beginning of Jesus’ ministry, the Holy Spirit fills Christ and leads Him into the wilderness. (cf. Luke 4:1) The Incarnate God is led toward forty days of solitude and of fasting. He is in perfect union with the Father and with the Spirit. He is of course the same Godhead as these, but He freely takes on our human nature, including our bodily form. The Spirit that descended upon Him in the form of a dove is within Jesus as He goes into the wasteland, and fills Jesus such that the Spirit overflows from inside Him and is shared abundantly with all who believe. Jesus is voluntarily led into battle in the wilderness by the Spirit. He, unlike us, is able to overcome temptation by His own power. We need His power. We are the formless void that requires God’s creative force to sow His goodness within us. (cf. Genesis 1:1, 1:31) Without God, we are a desert wasteland. We are nothing. Lord Jesus, your apostle Paul commanded us to make our bodies as temples of the Holy Spirit (cf. 1 Corinthians 3:16-17). The wasteland of human weakness becomes a temple of beauty that you fashion and sustain. 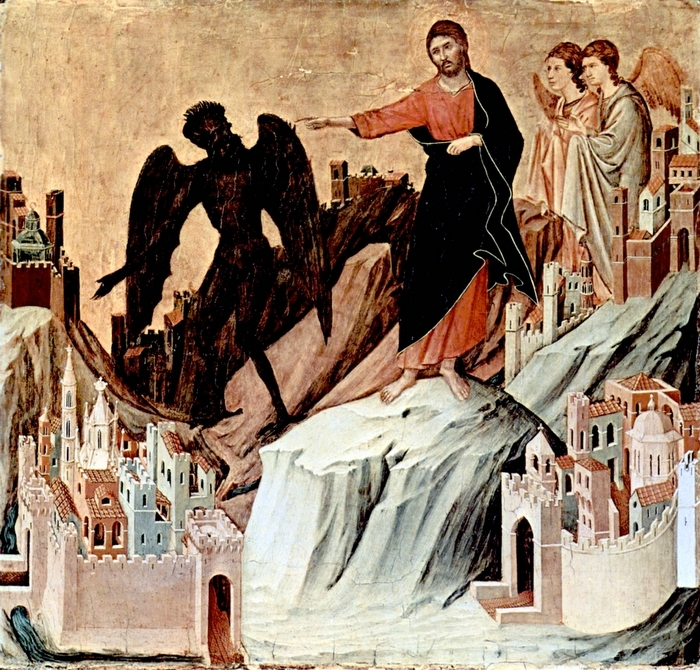 You were tempted on the top of the Temple in Jerusalem; be with us in mercy when our temple is crumbling under the advance of the prince of darkness. Do not submit us to temptations that are insurmountable, but aid us to overcome evil. Thank you, Lord for being one like us in flesh. Though we struggle with temptation as you did, we take comfort in your presence and we welcome you into our lives. Amen. Last edited by masklofumanto; 03-09-2019 at 09:51 PM. This excerpt is from a poem traditionally attributed to St. Patrick, though his authorship is not certain. It is quoted in many publications, including Christian Spirituality: Origins to the Twelfth Century (1986), by Bernard McGinn, Jean Leclercq, and John Meyendorff. 26 In the sixth month the angel Gabriel was sent from God to a city of Galilee named Nazareth, 27 to a virgin betrothed to a man whose name was Joseph, of the house of David; and the virgin’s name was Mary. 28 And he came to her and said, “Hail, full of grace, the Lord is with you!” 29 But she was greatly troubled at the saying, and considered in her mind what sort of greeting this might be. 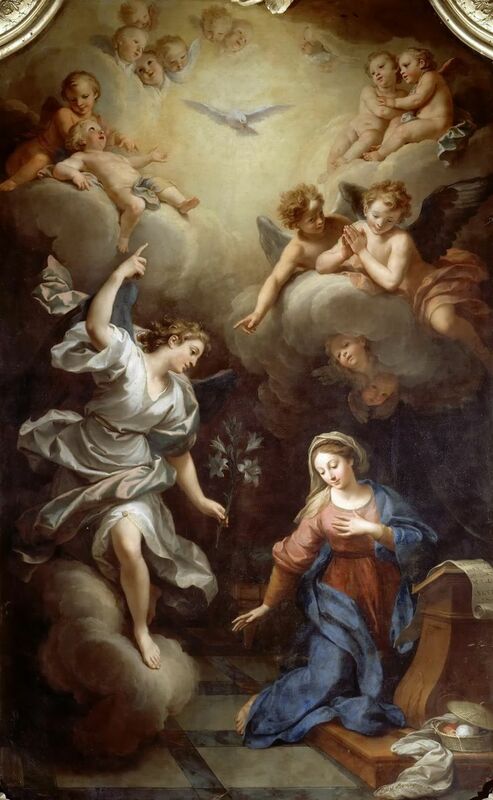 30 And the angel said to her, “Do not be afraid, Mary, for you have found favor with God. 31 And behold, you will conceive in your womb and bear a son, and you shall call his name Jesus. 32 He will be great, and will be called the Son of the Most High; and the Lord God will give to him the throne of his father David, 33 and he will reign over the house of Jacob for ever; and of his kingdom there will be no end.” 34 And Mary said to the angel, “How can this be, since I have no husband?” 35 And the angel said to her, “The Holy Spirit will come upon you, and the power of the Most High will overshadow you; therefore the child to be born will be called holy, the Son of God. 36 And behold, your kinswoman Elizabeth in her old age has also conceived a son; and this is the sixth month with her who was called barren. 37 For with God nothing will be impossible.” 38 And Mary said, “Behold, I am the handmaid of the Lord; let it be to me according to your word.” And the angel departed from her. April 1st will make a year since Michael "the iron horse," the creator of the Sunday Dispatch, has had any activity on, or logged into, the cigreviews forums. I don't know what happened to him. As Michael explains in the quote below, the Sunday Dispatch was started on the CreedNet forum, then migrated to a few other websites before finding its permanent home here. Clearly, like Jesus, Michael was willing to take the message to anywhere it would get a hearing! If you read through this thread from the start, you'll see it took quite some time before he got any feedback, yet Michael faithfully continued posting a dispatch every week, with the exception of a few Sundays here and there for various reasons. It is, however, a testament to Michael's faithfulness that this thread--in an "off topic" forum at that--has had more views by far than any other thread, in any of the forums, here at cigreviews! Thanks for your question Ohio. You are actually the first person who ever asked that question. I posted the first Sunday Dispatch on the CreedNet's Faith/Religion forum. Creed was one of the world's biggest rock bands in the late 90s and 2000s. They had a very active discussion boards. After SD.20, the website was closed without much of a warning to fans and members. I guess it just got to hard to handle. After that several members started their own Creed themed boards. I continued posting on those and soon started posting on other band sites. I then started posting on any board that would allow posts on religion or faith. One of the most unusual I guess was I found a brothel in Nevada that had a board with a open topic forum. I posted the Sunday Dispatch there for over a year until the forum was removed. A few years later the entire board was taken down. The brothel is now closed. Several sites I once posted on are no longer running and I was banned from a few. I have missed a few Sundays here and there due to travel, sickness, and computer problems. Today, I still post here and a few other forums. I post in the online community Interference which is about the band U2. I'm in the Free Your Mind forum. I also post on Facebook. I guess I will continue on. Again, thanks for asking. The last time Michael had disappeared for a while, for almost two months, I filled in for him. When he returned, he explained that his absence was due to computer problems. Then, when I returned in Dec. 2018 after a lengthy period of inactivity, I noticed that there hadn't been a Sunday Dispatch in over eight months, since April 1, 2018. So I took up the mantle left by Michael and restarted the Sunday Dispatches, realizing that, unlike last time, it would likely be permanent this time. Though our styles are obviously different--to be expected as we're from different faith traditions within Christianity--Michael was pleased with my having "filled in" for him last time, so I have to believe that he'd be pleased that the Sunday Dispatches continue on. Michael was truly a gentleman, and I mean that in the literal sense of a "gentle man." I cannot recall his ever speaking harshly in any of his posts; he always responded graciously. He didn't quarrel or judge, but was supportive to those who needed support and informative to all. He was always deeply faithful, and was a man who I think anyone would be proud to call a friend. I miss him. So this week's Sunday Dispatch is offered in his honor. 10 Jacob left Beersheba, and went toward Haran. 11 And he came to a certain place, and stayed there that night, because the sun had set. Taking one of the stones of the place, he put it under his head and lay down in that place to sleep. 12 And he dreamed that there was a ladder set up on the earth, and the top of it reached to heaven; and behold, the angels of God were ascending and descending on it! 13 And behold, the Lord stood above it and said, “I am the Lord, the God of Abraham your father and the God of Isaac; the land on which you lie I will give to you and to your descendants; 14 and your descendants shall be like the dust of the earth, and you shall spread abroad to the west and to the east and to the north and to the south; and by you and your descendants shall all the families of the earth bless themselves. 15 Behold, I am with you and will keep you wherever you go, and will bring you back to this land; for I will not leave you until I have done that of which I have spoken to you.” 16 Then Jacob awoke from his sleep and said, “Surely the Lord is in this place; and I did not know it.” 17 And he was afraid, and said, “How awesome is this place! This is none other than the house of God, and this is the gate of heaven.” 18 So Jacob rose early in the morning, and he took the stone which he had put under his head and set it up for a pillar and poured oil on the top of it. 19 He called the name of that place Bethel. Last edited by masklofumanto; 04-13-2019 at 07:12 PM.